Price is per 16-inch strand of these beautiful beads - each is different size, colour and shape, but average size is about 6mm x 5mm x 4mm. Millefiori, translates from Italian to "thousand flowers". Traditionally, each bead was handmade under the flame, using glass rods to produce a colorful mosaic effect. They were first crafted in Venice as far back as the 15th century, but it was not until the 1920s that they were produced in quantity. 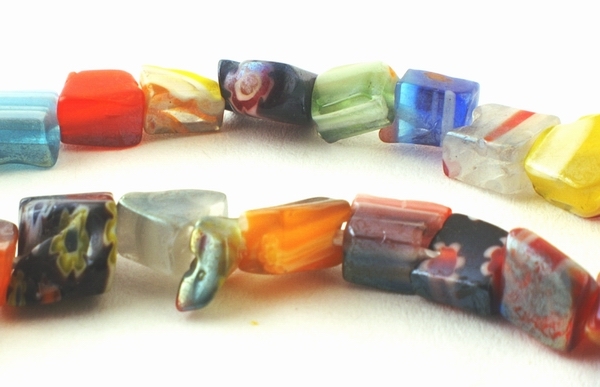 First glass rods are made like candy rock with multiple colors throughout. The colors at this stage are only viewable from the cut ends. The bead maker then cuts thin slices off while the glass is still hot and press them down to form mosaic patterns. This labor intensive process attracted a high price for the beads. However today, the millefiori technique has been applied to polymer clays which are pliable and do not need to be heated and reheated in order to fuse. This makes it much easier to produce millefiori patterns than with glass. There are hundreds of thousands of different designs of Millefiori beads, making them great to collect.